If you love Tuscany and Umbria then you will certainly love Le Marche. As we enter Le Marche from Romagna, there continues to be hilltop towns, some with forts and the patchwork of green gives way to yellow. 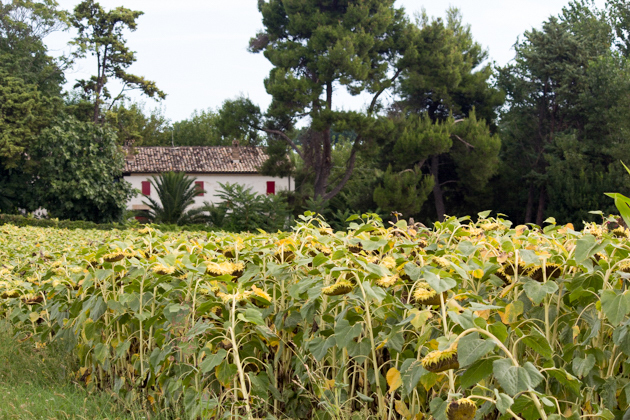 We pass field after field of sunflowers interspersed with vineyards and olive groves. My previous post was on Le Marche‘s coastline but similar to Tuscany and Umbria, the region also has historic towns to wander around in and beautiful cafés to enjoy. You can choose from local seafood along the Adriatic coast or porchetta (pork roasted with fennel, rosemary, and garlic) or skewered game birds (such as quail, pigeons, and partridges) from the interior of the region. 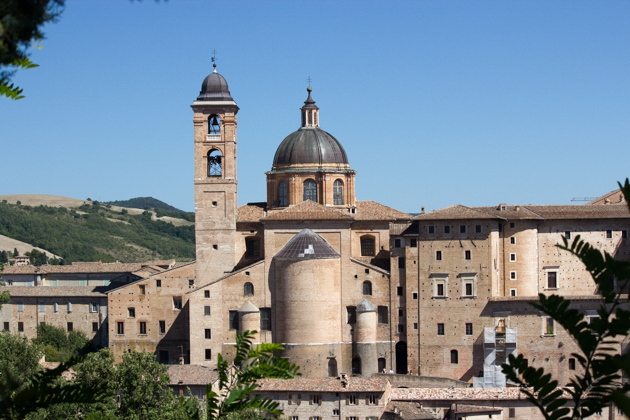 Starting from the north, visit the World Heritage Site and Renaissance city of Urbino. 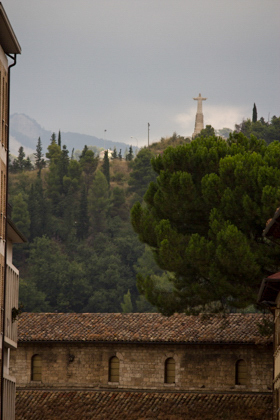 The Renaissance city of Urbino is a walled city built upon a hill. 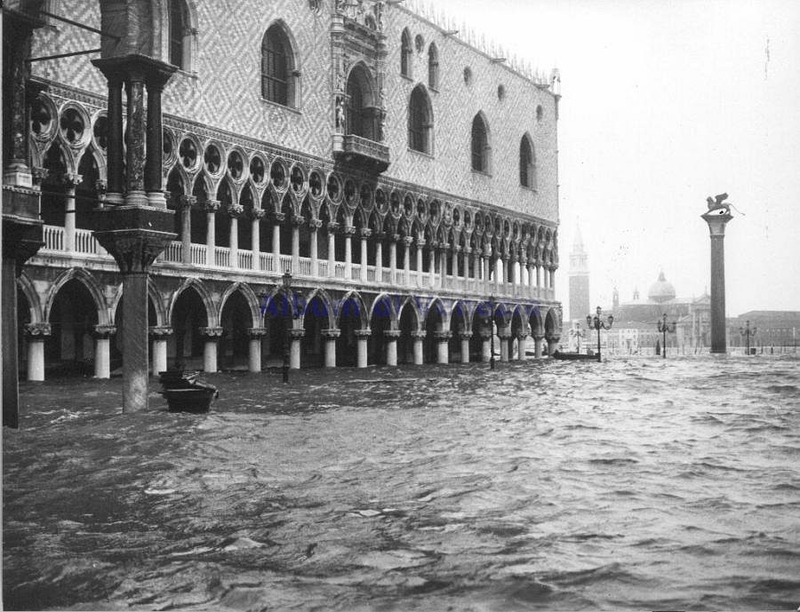 It benefitted from the patronage of Federico da Montefeltro, the Duke of Urbino from 1444 to 1482, who constructed the Palazzo Ducale (Doge’s Palace). 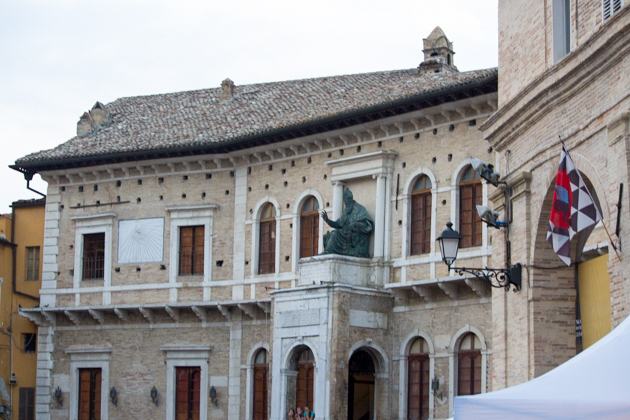 The Palazzo Ducale is the main tourist attraction in Urbino and houses the National Gallery of Le Marche (Galleria Nazionale delle Marche). 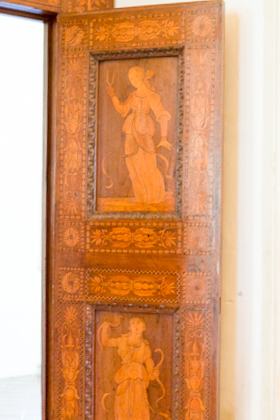 The palace is filled with tapestries, frescoes, paintings and elaborately wood inlaid doors and panelling. The most impressive room for wood inlay is the study. 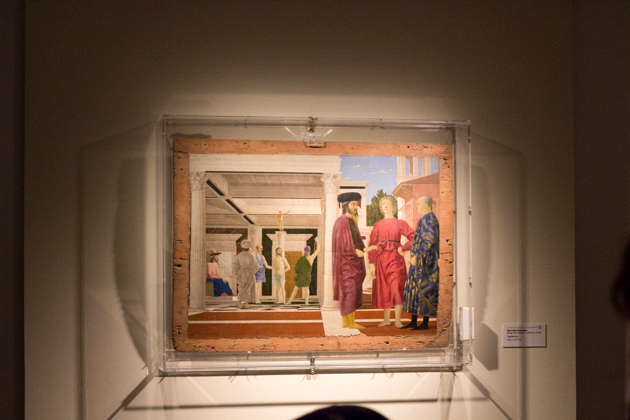 One of the contemporaries of Federico da Montefeltro, Piero della Francesca wrote on the science of perspective and his art is featured in the gallery. Federico’s court is depicted in Baldassare Castiglione’s book, Il Cortegiano (“The Book of the Courtier”), which set the standards for the European “gentleman” for centuries. Il Cortegiano is also the name of the restaurant we tried, situated across from the 11th century Duomo (next to Palazzo Ducale). We sat in the garden and happily munched on crisp yet ethereal crescia sfogliata (a flakey flatbread with a selection of fillings from Urbino), prosciutto di Carpegna, casciotto d’urbino (a local mild semi-firm cow’s milk cheese), black truffle pastas and roast suckling pig (porchetta marchigiana). Driving south along the windy road through the hills of eastern Le Marche towards Fabriano, there are signs for the Grotte di Frasassi (Frasassi Caves), the third largest cave in the world and the most accessible. There are three types of visits possible depending on how adventurous you are and how much time you have (ranging from 1.5 to 3 hours). 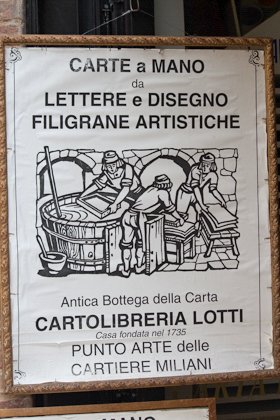 Fabriano is a UNESCO “folk arts” town that has been making top quality handmade paper for more than 700 years. It has many fine buildings and the town prospered in the Middle Ages and Renaissance due to its production of artisan paper. They have Fabriano paper shops in most major cities in Italy selling everything from stationary to paper jewellery. 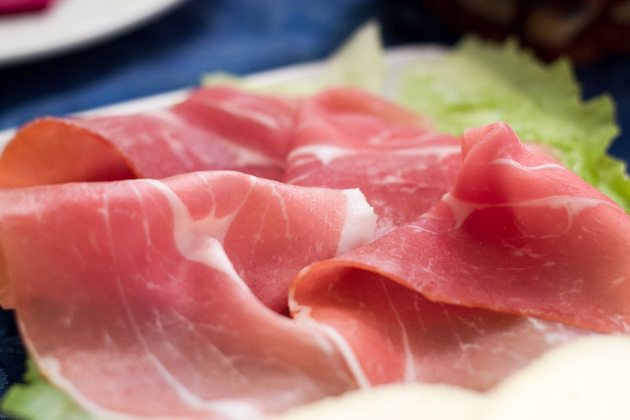 Fabriano is also known for its pork salumi, particularly the Campanaccio, soppresatta, mazzafegato, Lonzino del padrone, pancetta occhiata and salame di Fabriano. 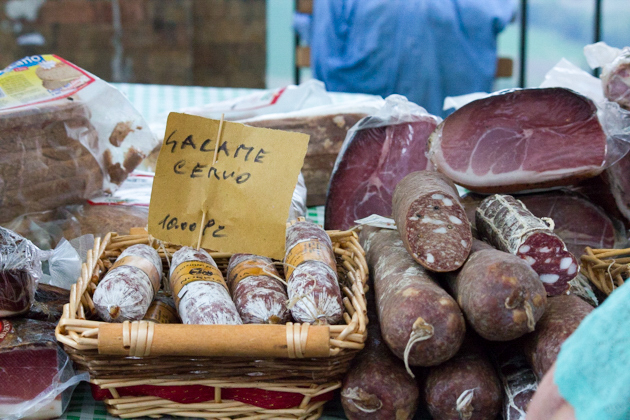 Salame di Fabriano is famous throughout Italy and the world. 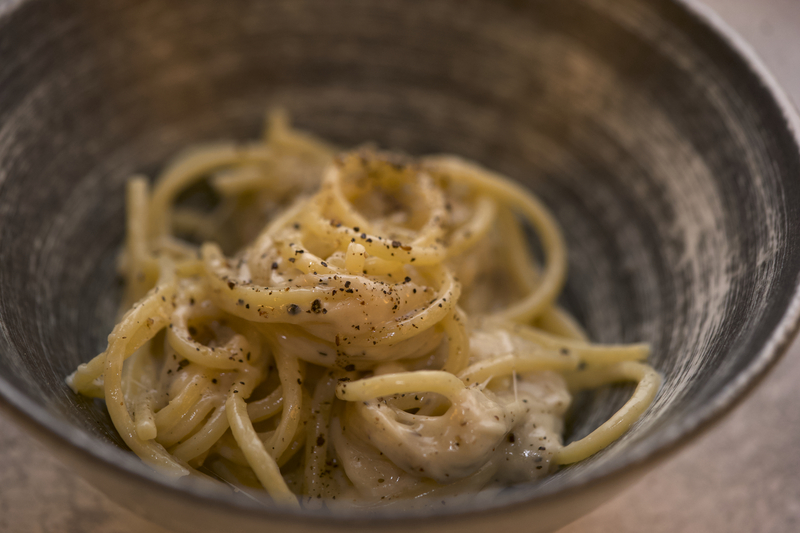 Fabriano‘s cuisine is rich in fresh egg pasta and meat dishes. In late August they host reenactments of Ancient Rome with falconry, battles, ancient Roman cooking, toga parties and games. Heading south near the seaside you come to Fermo, which is a hillside town overlooking the sea. 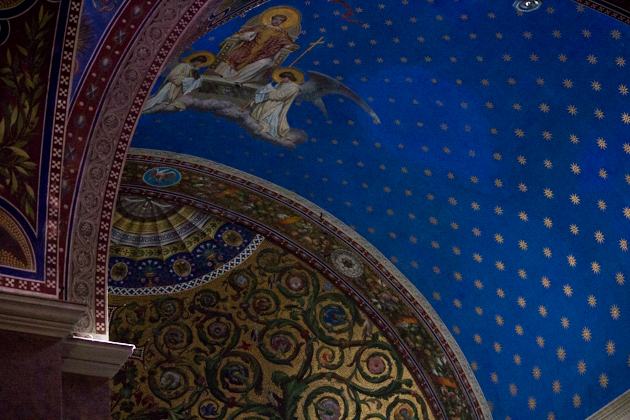 Take the lift or escalators to the ancient town centre, dating back to 264 BC and which is now mainly a pedestrian zone. The centre of town is a large square, the Piazza del Popolo, the location of many open air festivals like the antique fair we attended. They also host a well-known music festival during the summer. 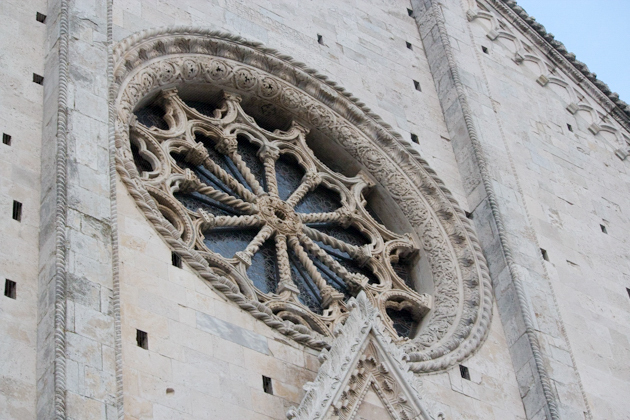 Climb to the top to see the 13th century Gothic Duomo (cathedral). We had wanted to dine at L’Enoteca Bar a Vino but sadly had not booked in advance. If anyone goes, please let me know how it is as it looked like an excellent restaurant. 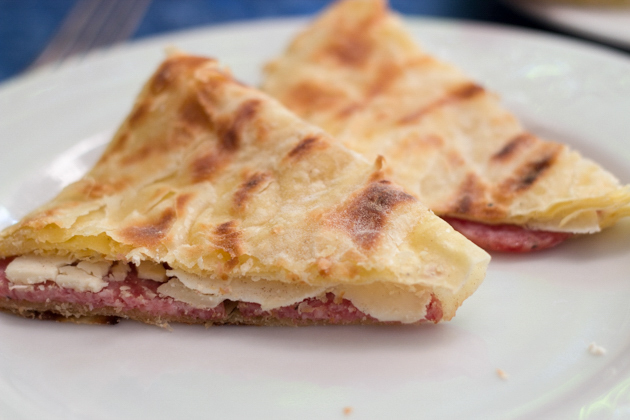 Nearby in Porto San Giorgio, we tried one of le Marche’s most famous cooking methods, potacchio. 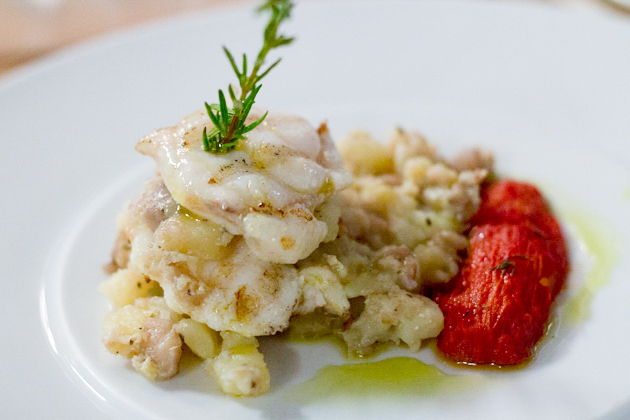 Potacchio is a way of stewing fish, rabbit, chicken or snails in white wine with garlic, chilli and aromatics. The dish gives off a heady perfume while the wet cooking method ensures juicy, succulent meat in a sauce you can’t help but dip bread into when no one is looking. 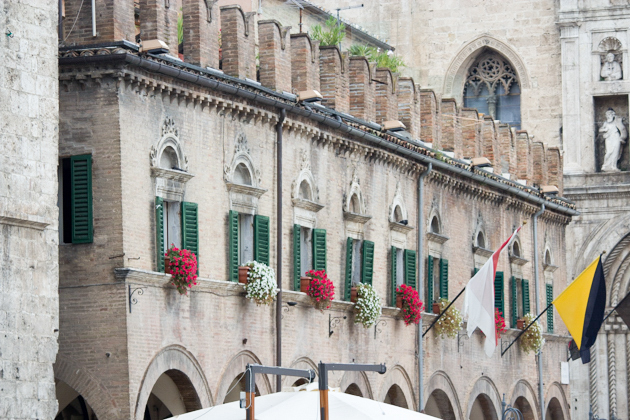 Continuing south towards Abruzzo, visit the pre-Roman city of Ascoli Piceno. 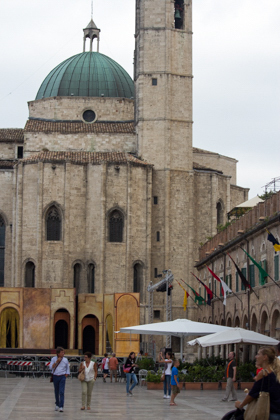 Ascoli Piceno was founded on the Via Salaria (meaning the salt road as it connected Latium (now Lazio) with the salt production areas along the Adriatic Coast). The historic heart of the city is built in marble and the main site is the Piazza del Popolo, said to be one of the most beautiful Renaissance town squares in Italy. 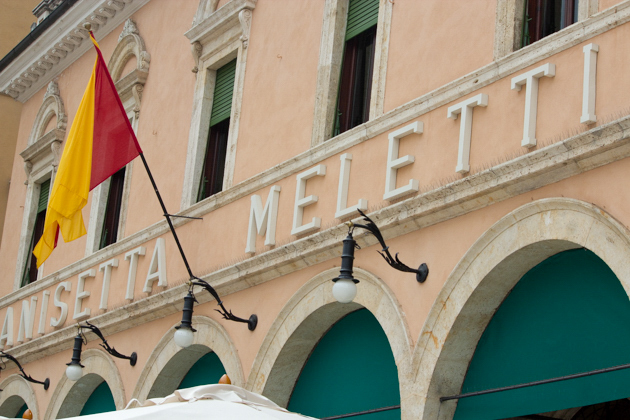 Sit in the stunning Art Nouveau Caffe Meletti sipping an aperitivo and watching the action in the square, as did many other distinguished patrons such as Sartre, Hemingway and King Victor Emanuele III. On the first Sunday in August they re-enact the Torneo Cavalleresco della Quintana, which includes a jousting tournament! 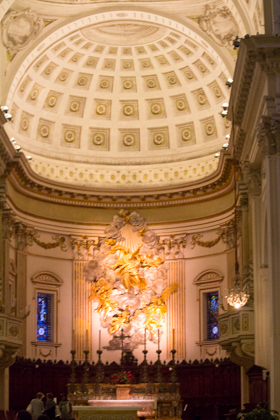 During the late summer evenings, performances such as Carmen take place in Piazza del Popolo. We entered Ascoli Piceno from Piazza Arringo where the cathedral of Sant’Emidio is located and it is definitely worth a visit. 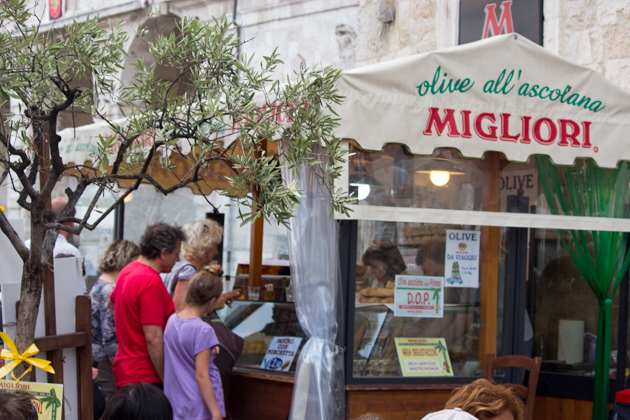 Also sitting on the square is Migliori, a restaurant which is famous for its olives which are stuffed with meat and breaded and fried (olive ascolane). You should also try the local red wine, Rosso Piceno Superiore. We found Ristorante del Corso, a small fish restaurant in a 16th century building where the owners go to nearby San Benedetto to buy the freshest fish directly from the sea. To read more about Le Marche, see here. If you enjoyed this post, please share it with friends and family. 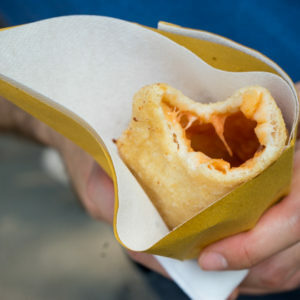 Buon appetit0! 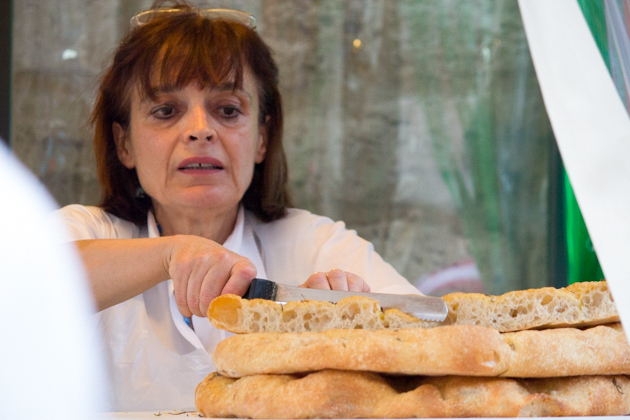 This bread is from Urbino and has been enjoyed since Medieval times. It is simply delicious. 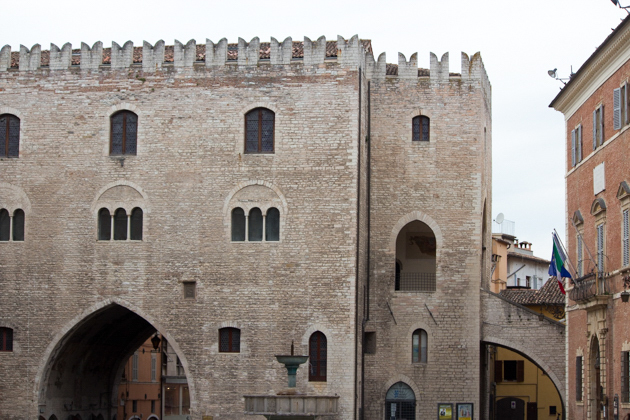 The fable accompanying its origin is that the sun fell in love with the beauty of Urbino so he flew so low that he was entangled with one of the towers of Palazzo Ducale. The sun tried to break free, creating sparks in the struggle. 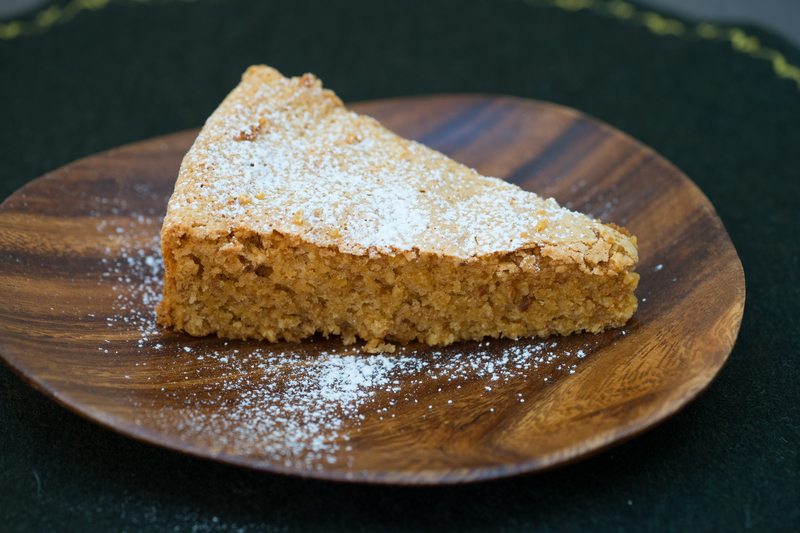 This inspired a young baker to make a pastry into a golden disc which would rise and desire to fly high, called a crescia. 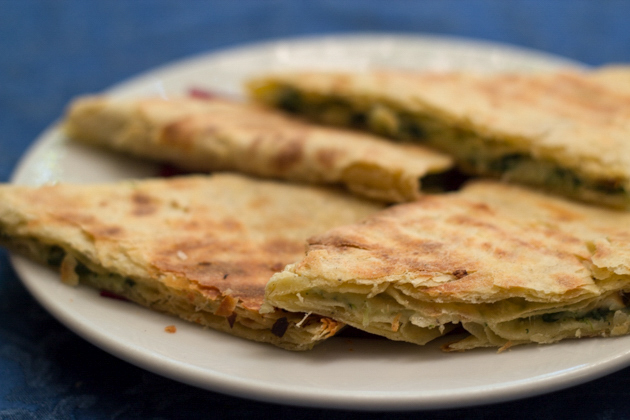 It is very similar to Indian paratha and can be stuffed with wild greens, vegetables, salumi, sausage or cheese. My favourite is potato and chard. Make a mound of flour and hollow out a hole in the centre. In this hole add the egg, lard, salt and pepper. Knead the dough, adding a bit of milk and water a spoonful at a time until the dough when pressed creates an indentation that immediately springs back, about 15 minutes. 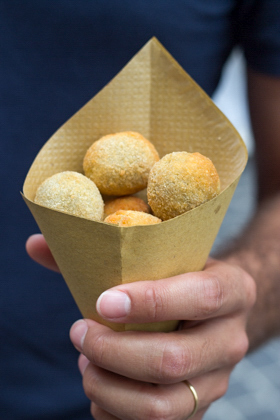 Divide the dough into balls of 130 grams each. Cover the balls with cling film and allow them to rest for half an hour. Roll each ball to form a sheet of dough 2-3 millimetres thick. Brush on a thin, even layer of the lard on the top of the dough. Starting at one end, begin to roll the dough up to form a tube. Turn the end of the roll inwards and roll the rest of it around to form a disc. Repeat with the rest of the dough. Cover with cling film and place in the refrigerator for one hour. Sprinkle some flour on the work surface. Use a rolling pin to flatten the dough until it is 3 mm thick. Place one disc of dough at a time in the hot pan, rotating it continually until it browns and has bubbles. Turn it over and repeat on the other side. Repeat with the remaining discs of dough until finished. 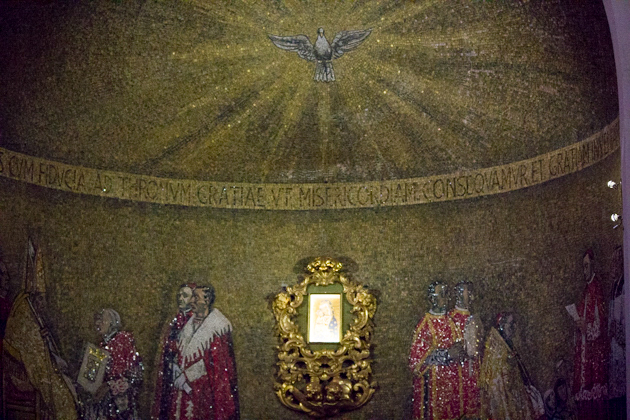 This restaurant is conveniently located across from the Duomo and the Palazzo Ducale. It doesn’t look like much from the outside with a bar and sandwiches in front but inside there is a large garden where they serve homemade breads, crescia sfogliata (similar to aloo paratha, a layered flatbread filled with potato and chard). A beautiful Austrian style Art Nouveau cafe on Piazza del Popolo. We have lived full time in Le Marche for the last 8 years, since buying and renovating our 300 year old farmhouse in 2001. It really is a wonderful, unspoilt place and so few tourist have yet to discover the beauty of Marche. Please do come and see for yourself – the stunning Conero National Park, just south from Ancona and the wonderful wild mussels, which can be eaten straight on the beach. Portonovo is one of the very few places they still grow wild. 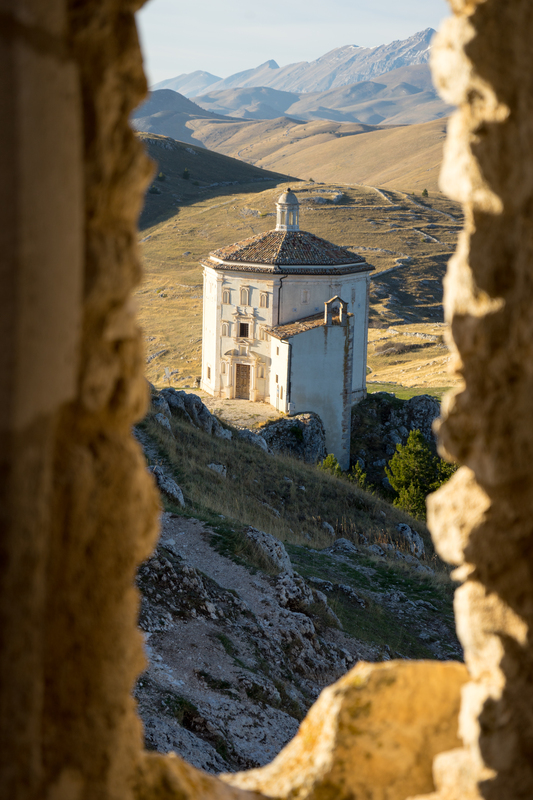 From here, don’t forgot to explore inland and the Sibillini National Park. Hike all day in beautiful, peaceful surroundings – a photographer and artists delight. The many hill top towns and villages are just waiting to be discovered – Amandola, Sarnano and San Ginesio, to name just a few. 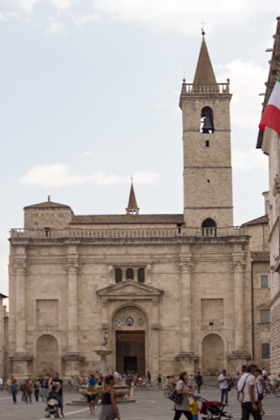 And then there is Ascoli Piceno, older than Rome and with one of the most beautiful piazzas in the whole of Italy, the white travertine will dazzle you. 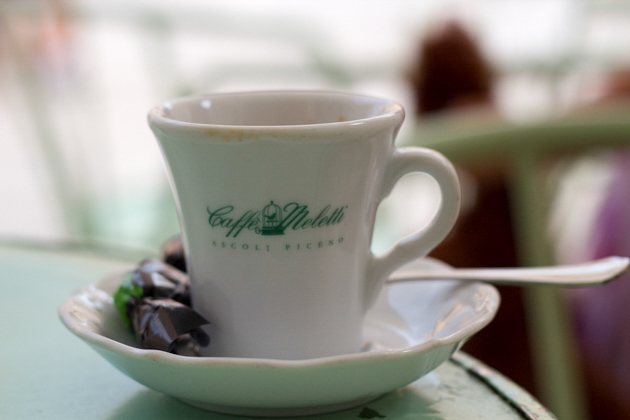 Sit in the famous Meletti Cafe and watch the world go by. Do come and discover Marche for yourself. If you are looking for accommodation whilst coming to stay in the area, marcheownersdirect.com are a group of like minded holiday home owners who have have years and years of experience and tips for the perfect holiday. Between them they have farmhouses and apartments, boutique hotels, agriturismos and bed and breakfasts and love talking about and sharing advice and information. Do come and visit us in Le Marche – You certainly won’t be disappointed! I totally agree. Anyone who travels to this part of the world cannot help but fall in love with it. I adore Ascoli Piceno. We will be back and next time we will try one of your holiday homes.